Is Wikipedia the neighborhood and development battleground of the future? Maybe. 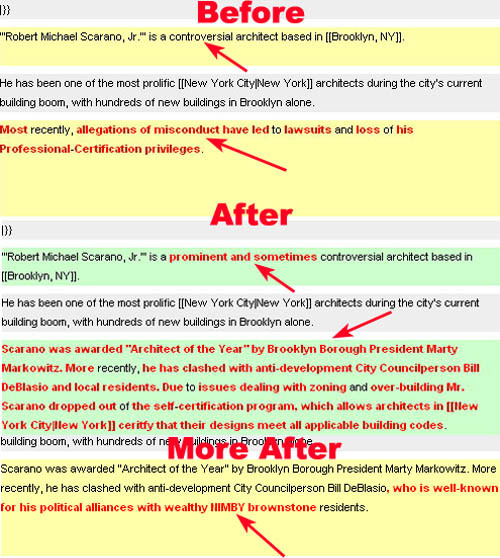 We say this because the Wikipedia page about architect Robert M. Scarano has become the subject of a weird tug of war between the architect (or his associates or supporters), his opponents and, increasingly, supporters and detractors of Council Member Bill de Blasio. The page has gone through so many revisions, in fact, that we can't even keep up. (And may change yet again between the time we post this and the time you look.) We know this because when we went to look at it, we found that a whole bunch of information regarding the controversy about Mr. Scarano's work had been edited out. The description of him as a "controversial architect," for instance, had been changed to "an architect." (By 5:08 PM yesterday he was a "prominent and sometimes controversial architect.") The entire sections about "Controversies" and "Controversial Works" had been smoked. Then, an hour later, they were back. The WikiWar revolves around both Mr. Scarano and Mr. de Blasio, who is leading the charge against the architect and who, himself, is viewed by some in the community as having ignored many construction- and development-related issues. Are you a visionary controversial beloved reviled honored despised developer? Subscribe to WikiGuard now and never miss a change in your Wikipedia entry. Don't leave anything to chance! For an additional $199.95 a month we will automatically change your Wikipedia entry back to the original language so you never have to worry about being redefined again. More to come. Probably by evening. All "controversial" content is gone again...I'll wait an hour or so and I'm sure it will be back up. "All Wikipedia articles and other encyclopedic content must be written from a neutral point of view, representing views fairly, proportionately and without bias." Anyone who simply deletes content that they disagree with and replaces it with their own should expect to get their edits reverted. "Articles should only contain material that has been published by reliable sources. Editors adding or restoring material that has been challenged or is likely to be challenged, or quotations, must provide a reliable published source, or the material may be removed." Unqualified adjectives such as "controversial" and "prominent" must have strong support in multiple, independent sources. Without it, it will be at best challenged, or more likely removed without warning. Show your sources, and the Wiki community will support you. Omit them, and you'll be seen as part of the problem, regardless of your point of view.